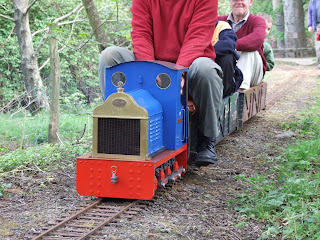 I report with great sadness the death of Terry Robinson, the man who built the Joys of Life Railway from scratch with the help of his friends. All though I never met him properly his wonderful little railway influenced my childhood, and thanks to the his high standard of original construction work we have been able to return the railway to operational condition. Thank You Terry, I hope you enjoy watching your railway flourish from the great workshop in the sky. Recently Ieuan & Wendy Jones have taken out Public Liability Insurance on the Joys of Life Railway, the cheapest way of insuring the railway was with a club policy, so a club has been set up, the name of which is The Joys of Life Model Railway Club. Membership of the club is open to all, whether you wish to participate in the club's activities or just make a contribution towards the cost of the insurance and enjoy the railway at the various running days held throughout the year. Despite this working party being on Halloween, there were no unpleasant surprises found in the “woods”. We concentrated our efforts on re-ballasting and packing majority of the remaining sections of track that haven’t already been done on the balloon loop. Over half the gang were driving up from the Porthmadog area and took the opportunity to watch the slightly larger 2ft gauge engines cross Britannia Bridge in Porthmadog first thing, before heading for Bethesda. We had the benefit of our largest working party gang so far of 8 people, this enabled us to get a lot of work done. Having arrived we gathered the tools we knew we’d require, assembled a train consisting of Meg, RoR panelled coach and two of the open bogie coaches which we would use to carry the ballast filled wheel barrows to the work site from the car park where the trailer which was situated (it’s a long way to Highfield with a heavy wheelbarrow!). Works Train at Highfield, judging by the expressions, a bag of ballast has just dropped it's bottom! Work began with lifting the track on the ‘up’ side of the balloon loop between Highfield & the first bridge, the formation was then levelled off and track was drilled for the attachment of wooden batons in the same fashion that we have done in places such as Moles Hill cutting. Fresh ballast was then brought up by train and laid onto the formation. The track was then re-laid and packed appropriately to take out some negative cant that had been there previously. By the end of the day we had also managed to do the same work on the ‘down’ side of the loop between the second bridge and Highfield with only a little packing work left to perfect the cant and supporting of the track, already a significant improvement is visible. Whilst this was takeing place Bill and Pete started work on constructing a retaining wall after noticing that we were losing a large amount of ballast down the side of the embankment shortly after Highfield ‘Up’ Platform were there had been a collapse in the past. By the end of the day their work stretched from just after the beginning of the embankment to almost halfway between the balloon loop point and the footpath crossing. A job very well done indeed, and it was thought that we could name these features “Bill’s Boulders” and “Pete’s Paving”. 'Pete's Paving' and 'Bill's Boulders' after! Many thanks to Pete Etchells for most of the photos. On the 10/10/09 'Attila' the railway's new resident steam loco passed it's first boiler steam test under it's current ownership at the NWMES track in Llandudno, we then spent the day racing around the circuit learning about how to run it, and I am very pleased to report that it runs beautifelly. I couldn't wait to take it to Bethesda so the following day (11/10/09) 'Attila' arrived at its new home line for the very first time. We spent a very enjoyable day pottering around the track not only learning driving and firing techniques, but also that a few parts of the railway need the angle grinder takeing to them! So 2 1/2 years after I first began the revival of the railway, we finally have a steam loco permanently back on the roster! Thank you very much to Paul Wood for attending all the way from St. Helens just so we could lift it out of the car because my dad did his back in lifitng it the previous day. 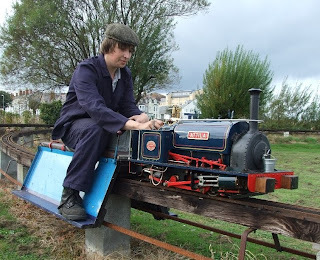 I am delighted to announce that the Joys of Life Railway is one step closer to getting a resident steam locomotive. 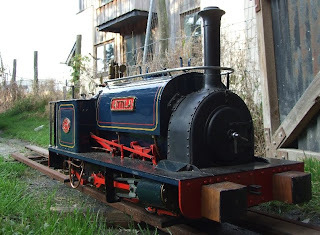 On Saturday 12/09/09 I obtained a virtually complete 5in gauge 0-4-0ST Quarry Hunslet, this has been thanks to the generosity of the loco’s builder, who has my assurance that the loco will be very much cherished. The loco named ‘Attila’ has not run for 9 years, but following some minor dismantling work on the 26/09/09 the boiler passed its 120psi hydraulic test at the North Wales Model Engineering Society track in Llandudno. 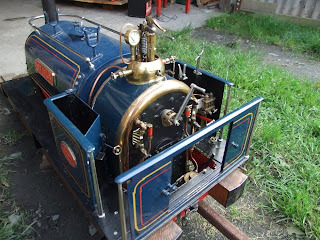 I now need to reassemble the loco before the steam test is carried out hopefully in a fortnight. My thanks go to Gordon for allowing me to obtain his delightful loco, Paul for putting us in touch with Gordon, and my dad for driving half way down the country to pick it up! Once Again, I was the first to arrive (apart from those who had stayed over) and straight away we were unpacking the various visiting locomotives. Firstly I had to unpack and reassemble the latest addition to the fleet, ‘Uproar Castle’, which was undergoing trials. This 4 motor version of the Ride on Railways ‘Jasper’ chassis is part owned by myself and Will High and still has some work to finish it off (a body), but I can report it runs very well. On the Saturday a brand new Maxitrak ‘Alice’ owned by Mike Poole had been on test around the railway running in, it remained on the line for the Open Day. Simon and his friend Stephen who arrived the night before and began to unpack the locos which they had brought, a Abbots Model Engineering railcar, the petrol-hydraulic loco and of course, ‘Tinker’ the 0-4-2ST Sweet Pea. Then at around 10am, the loco we were all so excited to see arrived, a beautiful model of the ex-Penrhyn Railway loco ‘Charles’. It soon made use of the recently modified unloading ramp and we had Charles sitting on shed in Bethesda for the first time in many years, even if it was on a different gauge! I then took ‘Uproar Castle’ on its first test run to collect the ECS from Moles Hill Tunnel (once we had found the keys that is!). As soon as the stock was back at Stokerton it was organized into 3 sets. 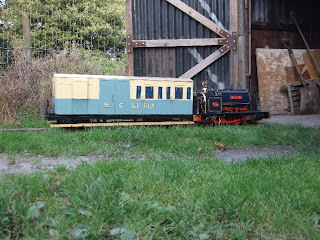 Two Passenger sets, one for Tinker, one for Charles and the goods set ‘Alice’ to look after up on the recently re-activated Quarry Siding where it would be undergoing further trials for the day. The major success of the 2009 open day was a frequent passenger train service, with one leaving Stokerton every 5 or 10 minutes when possible. This meant that there was only a short wait for the train waiting to pass it at Moles Hill, trains were able to pass at Moles Hill without requiring a signalman thanks to the hard and well spent efforts of volunteers Mike & Jilly(staying on the Caravan Site) who spent much of their holiday springing the points at Moles Hill so that they were trailable, not only did they do this but they also freed up the Quarry Siding point, helped Dave Mills reinstate parts of Stokerton signal box as well as completing various tasks around the railway. Yours truly acted as Control for part of the day and John Austin the other, this role is especially important now that majority of the points are connected up to the Signal Box (many thanks to Dave Mills for most of this), it’s a long walk for the driver if he needs to do it! The Highlight of the day for me was a ride behind ‘Charles’, listening to it charge to the top of Moles Hill bank even just on 2 carrs was fantastic. Not only did the 2009 Open Day have the most locomotives but it was also the most train intensive. It most certainly was the best so far. Most people who came along commented on how enjoyable it was and all I can do is agree with them. I am already looking forward to the next Running day! Photographs can be found HERE & HERE. On 26/o5/09 Paul Wood and I set out to take the twist out of the track between Bangor Road LC and Moles Hill bottom end point this involved cutting foot long sections of 2x1 then drilling through the steel sleepers every so often and screwing the sleepers to them. We do this because the steel strip sleepers have proven to be too thin to pack. We finished installing sleepers along the whole cutting by the end of the day but had no time to begin packing it this will take place in the near future. Once this has been completed we aim to dig out the old ballast on the road side on the balloon loop, fit batons to the track there then relay it with new ballast, we aim for this to take place June/July in preparation for the main 2009 running day to take place in August, which should also include the operation of a new electric loco addition to the fleet, with drawings on show of the future bodywork. So with the main 2009 running day on the horizon (and I have some very exciting locos in mind, hopefully something which'll excite every Penrhyn Railway enthusiast) you may be interested in attending? Well the easiest way to attend is to give us a day or so of your time to help reballast the section of the balloon loop, the more there is of us the quicker we can get it done, and perhaps even have people on other jobs such as Moles Hill points which with a little machineing could be getting close to being linked up with the lever frame. So e-mail me on williamchigh(at)gmail.com replace the (at) with an @, to register interest. A pre preservation volunteer was staying at the caravan site this past weekend so the decision was taken to run some trains for him to relive happy memories, it also marked Dave Mills' 'Welsh Pony's entry to traffic following the running in last weekend, I'm hoping that perhaps one day we'll see an official naming ceremony. 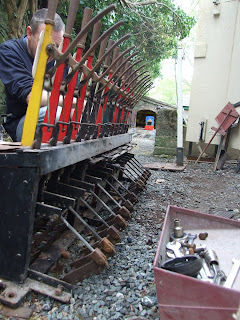 During the course of the day he and a few others took the opportunity to begin dismantling Stokerton Signal box, we would have worked at Moles Hill as it is smaller, has been dismantled and new parts all ready machined, but the need for a milling bit prevented this. all parts needed labelling so this was done, and the lever frame had to come out which was most impressive. Well, where to start? What a busy day 18/04/09 was. I was the first to arrive at Bethesda, the sun was shining and everything was quiet, but not for long. It soon became 11am and we had to start getting ready. I went up to the tunnel above Moles Hill with Meg to get the empty coaching stock. Once back at Stokerton, we briefed all the drivers on how to use my walkie talkies and Harry’s temporary signalling scheme, very similar to that of the F&WHRs. I can report that the signalling worked very well, but the walkie talkies could be a tad annoying at times. It was hoped that two steamers would visit the line, however only arrived and it was soon discovered that the Tich’s springs hung too low and caught on the check rails, meaning it couldn’t run. So with no steam we turned to the petrol, finally after many days of trying Dave Mills’ Welsh Pony burst in to life, it attempted a couple of laps but as it was the first proper run some bits vibrated loose but following some tweaking it completed its first true lap of the line, a loco designed and built for the railway about 10years ago finally doing the job. And doing that job incredibly well what a sight, smell and sound (something for the senses! ), riding behind it was incredible but being allowed to drive it was even better. You could hear it working hard on the gradients near Highfield from Stokerton. 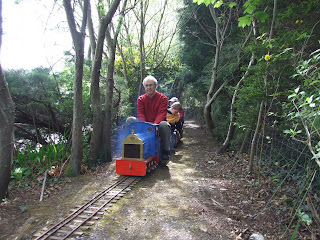 With the reliability of Welsh pony much improved, we started a two train service with Meg on the other set. 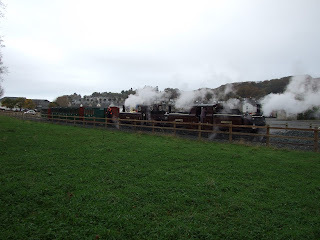 Trains crossed at Moles Hill for the first time in preservation so there was plenty of action. I think I can speak for everyone when I say it was a very enjoyable day. Thanks to everyone involved, sadly though as we were so busy not many photos were taken, but check back soon as I may have some. I'm 17 and live in North Wales right next to the Ffestiniog Railway where I enjoy spending my free time volunteering. I also began the revival of the Joys of Life Railway (5in www.freewebs.com/joflrailway ) where I enjoy running my Quarry Hunslet 'Attila'.